This one is bound to get some attention. Remember how the Sigelei Fuchai Duo 3, Reuleaux RX2/3, and Tesla Invader 2/3 had the optional 3rd battery door? 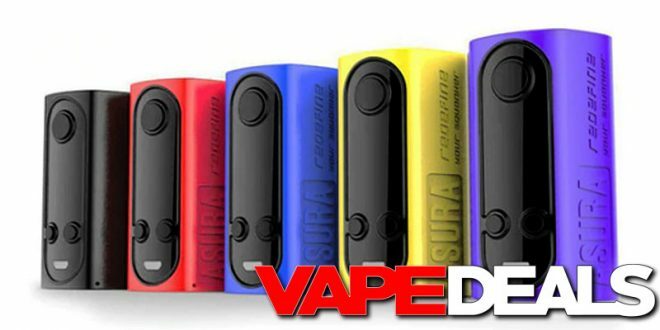 Well, the new Hugo Vapor Asura is using that same concept…except with a squonk attachment! It’s an innovative idea, to say the least. The price point ain’t bad either. You can pre-order one from Vaporl for only $30.18 if you apply coupon code “HHN15” at checkout. Don’t want to wait for a pre-sale? 3avape already has the Hugo Vapor Asura in stock and ready to ship. It’s listed at $59.99, but the price automatically drops down to $41.30 when you log into your account. After that, just use coupon code “HW10” to get the extra 10% off ($37.17 total). Supply is very limited (only about 35 in stock), so you’ll have to move fast. Shipping is FREE on orders over $60.